Mathematicians call 2017 a prime year because 2017 has no prime factors other than 1 and 2017. Those crazy number theorists. I try to write at least one post here per month. I managed two in January. One of them raged at a Trump executive order that compelled federal libraries to rat on their users. Update: Trump is still president. The second pointed out that Google had implemented cookie-like user tracking on previously un-tracked static resources like Google Fonts, jQuery, and Angular. Update: Google is still user-tracking these resources. 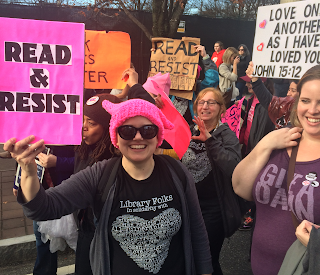 For me, the highlight of January was marching in Atlanta's March for Social Justice and Women with a group of librarians. Our chant: "Read, resist, librarians are pissed!" In February, I wrote about how to minimize the privacy impact of using Google Analytics. Update: Many libraries and publishers use Google Analytics without minimizing privacy impact. In March, I bemoaned the intense user tracking that scholarly journals force on their readers. Update: Some journals have switched to HTTPS (good) but still let advertisers track every click their readers make. 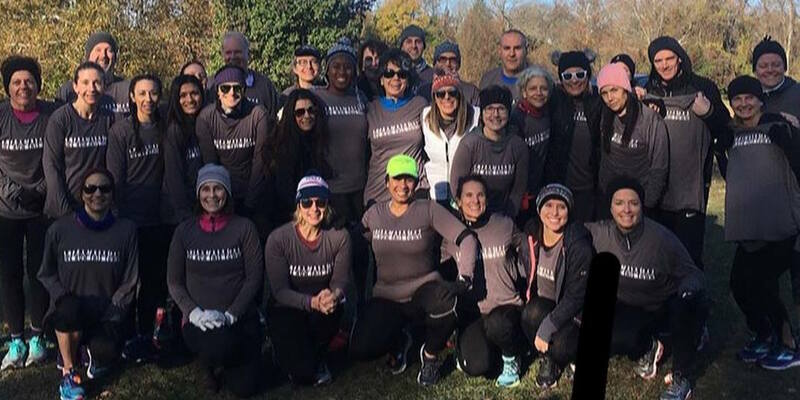 I ran my first-ever half-marathon! In April, I invented CC-licensed "clickstream poetry" to battle the practice of ISPs selling my clickstream. Update: I sold an individual license to my poem! 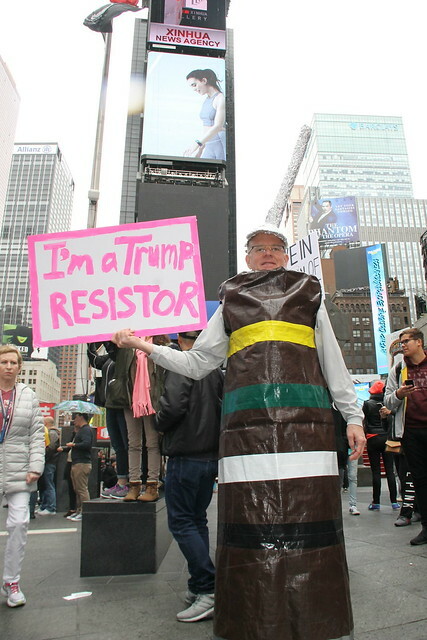 I dressed up as the "Trump Resistor" for the Science March in New York City. For a brief moment I trended on Twitter. As a character in Times Square, I was more popular than the Naked Cowboy! In May, I tried to explain Readium's "lightweight DRM". Update: No one really cares - DRM is a fig-leaf anyway. In June, I wrote about digital advertising and how it has eviscerated privacy in digital libraries. Update: No one really cares - as long as PII is not involved. I took on the administration of the free-programming-books repo on GitHub. At almost 100,000 stars, it's the 2nd most popular repo on all of GitHub, and it amazes me. If you can get 1,000 contributors working together towards a common goal, you can accomplish almost anything! In July, I wrote that works "ascend" into the public domain. Update: I'm told that Saint Peter has been reading the ascending-next-monday-but-not-in-the-US "Every Man Dies Alone"
I went to Sweden, hiked up a mountain in Lappland, and saw many reindeer. In August, I described how the National Library of Medicine lets Google connect Pubmed usage to Doubleclick advertising profiles. Update: the National Library of Medicine still lets Google connect Pubmed usage to Doubleclick advertising profiles. In September, I described how user interface changes in Chrome would force many publishers to switch to HTTPS to avoid shame and embarassment. Update: Publishers such as Elsevier, Springer and Proquest switched services to HTTPS, avoiding some shame and embarrassment. I began to mentor two groups of computer-science seniors from Stevens Institute of Technology, working on projects for Unglue.it and Gitenberg. They are a breath of fresh air! In October, I wrote about new ideas for improving user experience in ebook reading systems. Update: Not all book startups have died. In November, I wrote about how the Supreme Court might squash out an improvement to the patent system. Update: no ruling yet. 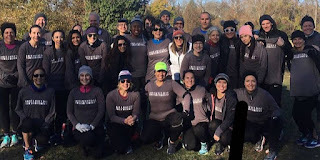 I ran a second half marathon! In December, I'm writing this summary. Update: I've finished writing it. On the bright side, we won't have another prime year until 2027. 2018 is twice a prime year. That hasn't happened since 1994, the year Yahoo was launched and the year I made my first web page!